Boer and Brit Guest House is situated in Ladysmith, an area rich in history as many battles were fought in the area during the Second Anglo-Boer war. A number of museums, cemeteries and monuments can be found in and around the town. The guesthouse is aptly named from the time when the town was under siege by the Boers and several ferocious battles ensued in the area. The establishment is nestled amongst valleys and lush landscapes, proving guests with breath-taking views as well as excellent hospitality. 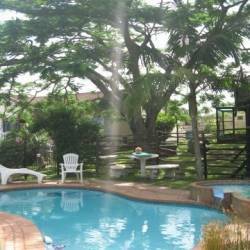 The self-catering accommodation is suitable for 2-3 guests, each room is equipped with a fully equipped kitchenette, TV’S with DSTV and en-suite bathrooms. For a larger group or a family of 6, the 2 bedroom cottage is spacious and furnished with an open plan kitchen, en-suite bathrooms, lounge area and a dining room. The indoor and outdoor braai facilities are perfect for entertaining, come rain or sun! For those who enjoy exploring and getting “out and about”, chat to your friendly host Adaleen who can assist with a number of exciting tours – back to the battlefields of yesteryear.